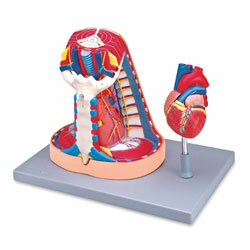 This life-size model is composed of five parts, including a 2-part heart that provides an interior view of the chambers and valves. The sternum and thymus are removable to reveal the pericardial sac and the major pulmonary and systematic vessels. The trachea and esophagus are shown entering the mediastinum through the superior thoracic aperture; the inferior thoracic aperture is delimitated from the diaphragm musculature. Mounted on base. 16" x 10" x 12".